When Jessica came into our office, we were immediately charmed by her warm and kind personality. We first met her when her father had his rotator cuff surgery performed by Dr. Armin Tehrany. Unfortunately, we met again in not that pleasant of circumstances. She had her appointment with Dr. Tehrany because of the Labrum Tear in her shoulder that warranted labrum tear repair. As she describes in the video, moving the arm around her body was excruciating and the shoulder always popped out and clicked. 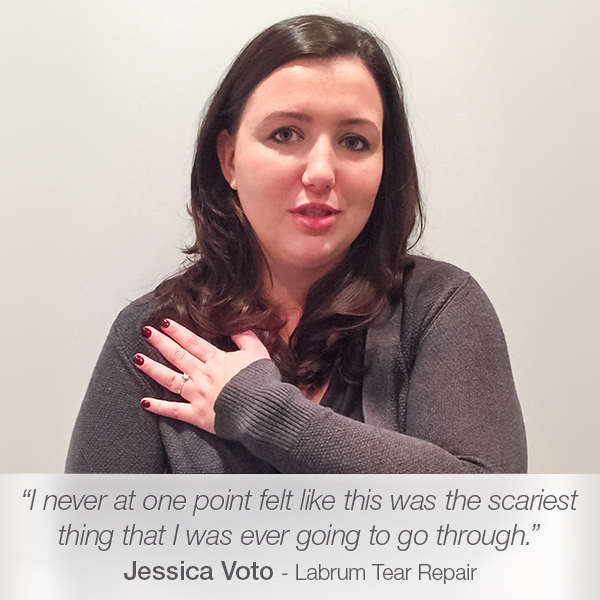 At Mount Sinai Hospital, Dr. Armin Tehrany performed a labrum tear repair. The surgery and the physical therapy went perfectly well. So, now six months after the surgery, Jessica is feeling even better than she felt prior the labrum tear repair surgery. “Hi, my name is Jessica Voto, I’m 27. I came to see Dr. Tehrany because every time I picked up my arm like this, my shoulder would pop out, and if I went like this, it would click, really loud, audibly loud, and it was extremely painful. So, first we tried some physical therapy at an office, to see if we could strengthen up the capsule and repair the label tear that way. It didn’t work, so then I decided that I would go for the surgery. I’m really not entirely positive what we did, but it felt great, immediately afterwards. The entire time I was at Mount Sinai for my surgery, from the moment I walked through the door till the moment I went under, I was greeted with some the kindest people I’ve ever met. The anesthesiologists -there were two- were funny and witty, and they made you feel comfortable even though they were stabbing you with really big needles. From the start to finish of the day, I never at one point felt like this was the scariest thing that I was ever gonna go through. It wasn’t. It was nothing really, at the end of the day. It was surgical – yes, that can be terrifying. But was it so terrifying that I would never do it or I wouldn’t recommend anybody else do it? No, because today, six months, (less than six months!) later, I can go like this, I can go like this, I can go like this and I can put my arm behind my back, which was excruciating before.